SKU: 20127004. Category: Bracelet, Commemorative. 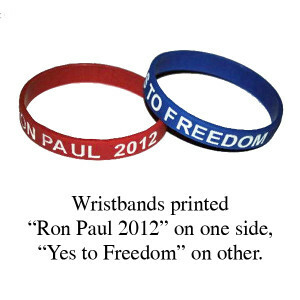 Show your support for Ron Paul for President in 2012 with our red or blue color debossed wristbands. These flexible bands are durable and are made from 100% silicone. The wrist bands are printed with the words “Ron Paul 2012″ on one side and “Yes to Freedom” on the other. This is for the RED band.